Whereas the federal poverty level would be $17,170 a year for a family fitting that description – no matter where they lived in the United States – the self-sufficiency standard estimates that it would take $54,590 for such a family to live comfortably but without frills in San Francisco County, $49,823 in Contra Costa County and $63,871 in San Mateo County. Are you kuckin’ fidding me!?! Now granted, this is for a family of two parents with an infant child. BUT STILL! We are talking about an income north of 63 large. $63,000! And they are struggling to make ends meet? I read the article twice. I regret to inform you, gentle reader, that these people are DEAD serious. Okay, okay. So…so what? So, like, what is the conclusion? “This report raises important questions about how we can better serve the thousands of low-wage workers and families who were already struggling before the recession, whose situations are undoubtedly more precarious now,” said Anne Wilson, chief executive of the United Way of the Bay Area. How we can better serve people who make about 55k? Un-be-liev-able! Anyone making about $55,000 has the ability to move. Anyone else think these numbers are just made up so that about 20% of the population will fit? No wonder California is broke. This entry was posted in Economics, States Behaving Badly and tagged California, Left, Leftist, Liberal, Politics, Recession. Bookmark the permalink. I live here in the land of leftward loons and goons and am researching my own relocation. I don’t live in the Bay area, but agree with the premise that the cost of living there is outrageous when compared to other parts of California and certainly the rest of the United States. $55k in San Francisco won’t get you much if your rental costs $2,500 per month or you have to commute from Los Banos (121 miles away) or Modesto, (92 miles away). 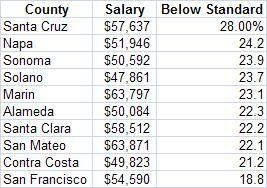 And since housing costs and rent in Modesto has gone up because of Modesto’s bedroom status for Bay area jobs, it’s not difficult to see where $55k will get you: not very far. So, I guess the question remains, where in America can I find a job right now that pays me a comfortable living that will get me out of California, because, if I leave California I’m going to have to work somewhere else, and I know from personal experience that the salaries paid in some states remains at or near the federal minimum wage, which doesn’t bode well even if the cost of living is 10-20% lower than Calfiornia’s.